Welcome to Silicon Valley’s search for fulfillment and purpose beyond devices, money, and power. With worker stress at an all-time high, particularly in the fast-paced technology industry, it’s no surprise that Google, Salesforce, and Apple have adopted mindfulness and meditation into their workplace culture. Studies show mindfulness practice increases emotional intelligence, reduces stress, and enhances health and overall well-being. A Sense of Something Greater goes deeper than the current mindfulness trend, into the heart of Zen practice. For Les Kaye, Zen is more than awareness––it’s also “the continued determination to be authentic in relationships, to create meaningful, intimate, intentional bonds with people, things, and the environment.” Kaye’s teachings are paired with interviews with current tech employees and Zen practitioners, conducted by journalist Teresa Bouza. 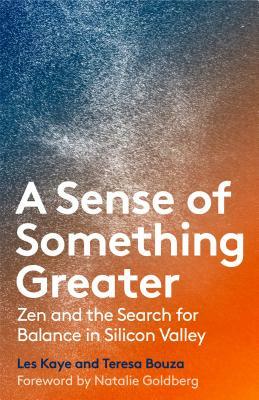 A Sense of Something Greater is an essential book for business leaders, mindfulness meditators, and Zen practitioners alike. Les Kaye worked for IBM in San Jose, California, and for over thirty years held positions in engineering, sales, and management. Les started Zen practice in 1966 with a small group in the garage of a private home. He was ordained a Zen monk by Zen Master Shunryu Suzuki in 1971. In 1985, he was appointed teacher at Kannon Do Zen Center in Mountain View, California. His first book, Zen at Work, includes stories of how his own meditation practice enhanced the quality of his life and work. He and his wife Mary live in Los Altos.